Why a sound bar may be your best audio option. You just bought the state-of-the-art Ultra HD TV you’ve had your eye on. Clear-as-crystal picture, bells and whistles galore – and sleek styling that fits perfectly with your home décor. It looks great in every way. But that’s the problem. While it looks great and gives a picture so real you feel as if you could reach right inside the scene, your TV sounds – well, thin. As thin as the TV itself. So how do you improve your TV sound to make it as clear as the image on the screen? One way to solve your sound issue is by setting up a home theater system. But a minimum of five speakers are required for a proper setup. For a more impactful surround experience, you’ll want to use seven speakers, plus a subwoofer. With all these AV components in your room, your TV movie sound will be great. But having the cables and wires from those components strewn around won’t be so great. What do you do? That’s where the sound bar comes in. Sound bars incorporate stereo, left/right/center, 5.1-channel or even 7.1.2-channel audio into an easy-to-set-up device you plug into your TV’s HDMI® or optical port. 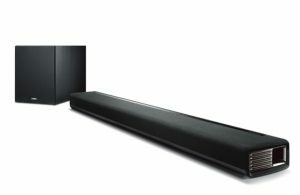 Yamaha designs its sound bars as a complete independent audio system, providing extraordinary depth and dynamics to TV sound. 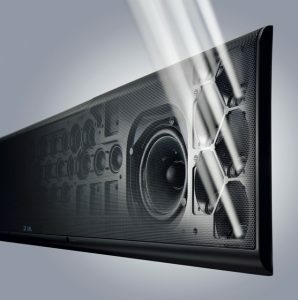 Some sound bars, such as the Yamaha YAS-706, come with a wireless subwoofer, enhancing deep bass tones and adding “oompf” – great for enhancing movie soundtracks. 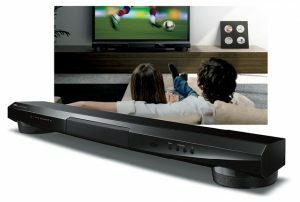 Plus, our sound bars include Bluetooth® for music streaming. So when you’re not listening to your impressive movie audio, you can use it as your go-to music listening device. The YSP-5600 delivers authentic 7.1.2 surround sound thanks to Dolby Atmos and DTS:X. While today’s TVs are thin, their sound no longer has to be. Choosing a home theater system or a sound bar is a matter of personal preference, but with its easy installation, extensive connectivity and space-saving design, a sound bar can be the ideal way to fatten up that thin TV sound.